Driven mainly by commercial motives, Portuguese explorers in the 15th and 16th centuries sailed down the coast of Africa and across the Indian Ocean to get direct access to the spices of Southeast Asia and the luxury goods of the Orient. By the mid 16th century, the Ming government realized that reviving trade along the southeast coast would improve prosperity and tax income. In 1557 the Ming granted the Portuguese a license to trade at the city of Macau, located on a small peninsula on the south China coast, close to the major provincial city of Canton. 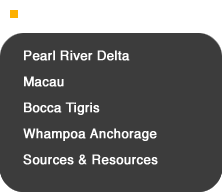 (Macau is the official modern spelling; Macao is an older English spelling). 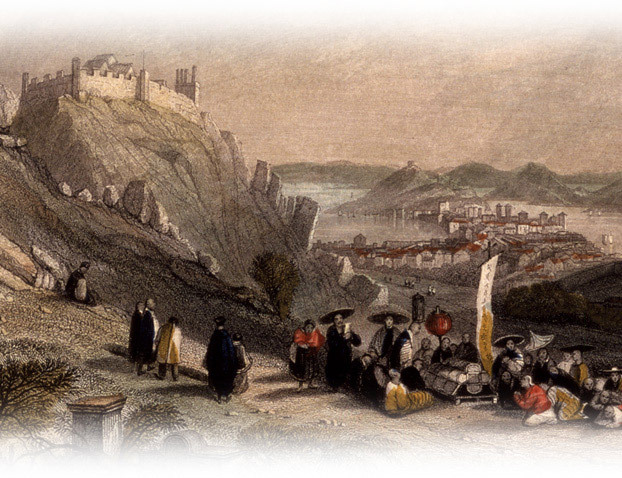 Macau had a warm climate, an attractive beach, a good harbor, and an excellent location for trade. It prospered in the 16th and 17th centuries, but declined as a major trade port after the rise of the Canton system. The Portuguese, however, held it as a colony until they returned it to China in December, 1999. The bay of Macau, located at the mouth of the Pearl River, can be seen in this landscape. In 1557 the city was leased to the Portuguese, who helped to restore the export of Chinese silk to Japan after China had closed its ports to the Japanese due to the threat of multi-racial pirate raids. 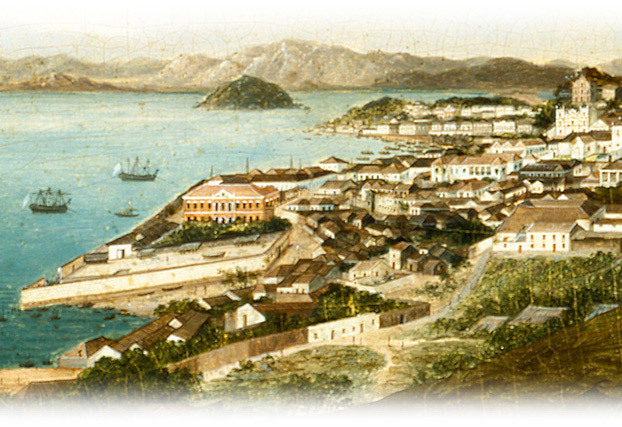 As a Portuguese colony, Macau was the only location in China where Westerners and their families could live year-round. For the four months of the trading season merchants were allowed to reside up-river at Canton, though no women were allowed. Macau offered a lively social life and diverse population intermingling Westerners and Chinese. Its area of 23.5 square kilometers included granite hills topped by fortresses, whitewashed Portuguese churches, trading houses, and residences, and was known in many artworks by the distinctive crescent-shaped Praya Grande beach. Macau was the most European of the Pearl River cities, described as a “good Portuguese town” with whitewashed churches and western-style homes. The Praya Grande beach—seen here from Nathan Kinsman’s veranda—became its most famous view. 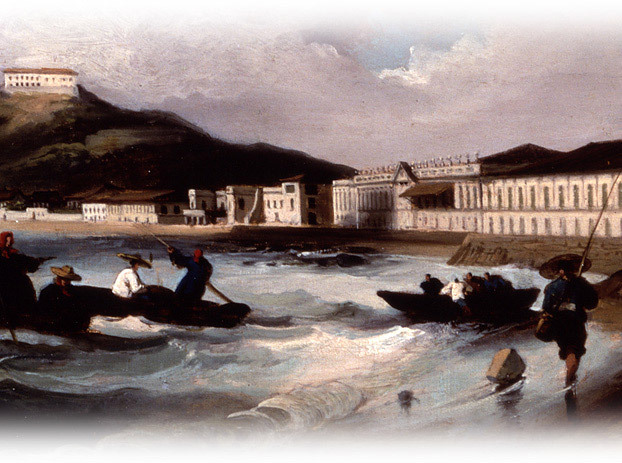 Merchants were permitted to reside in Macau with their families year-round. 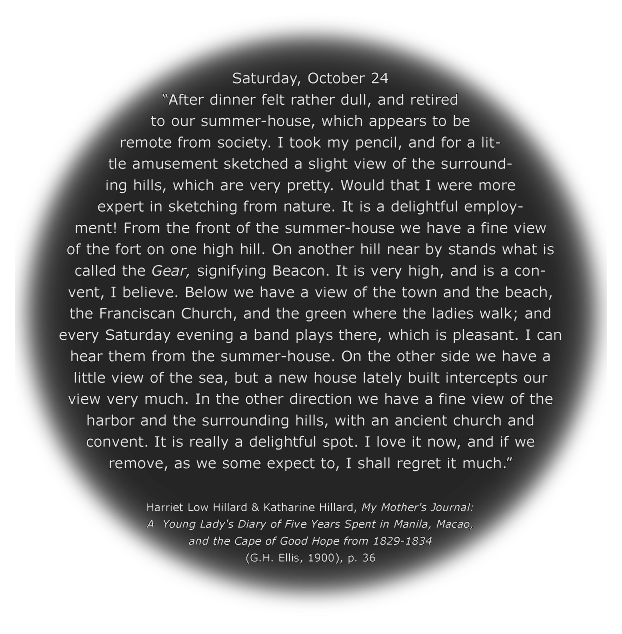 Kinsman’s wife, Rebecca, kept a detailed journal of her experiences in China. Robert Morrison arrived in China in 1807 and stayed there for nearly 27 years. As the first Protestant missionary in China, he faced heavy opposition from the resident Catholics as well as imperial officials, who tried to prevent him from learning the Chinese language. But he persevered on his own, obtaining a post as translator for the East India Company, which allowed him to live in Canton while his wife stayed in Macau. The foreign merchants appreciated his skills, but when he began translating Biblical texts the Qing government declared it a capital crime to publish Christian books in Chinese. Still, Morrison produced on his own a translation of the Bible into colloquial Chinese and the first Chinese English dictionary, after 16 years of work, distributing them secretly with Chinese helpers. He also founded both a dispensary to give ordinary Chinese effective Western medicines, and the Anglo Chinese college at Malacca. He trained several Chinese assistants to carry on his work, creating a small Christian community. 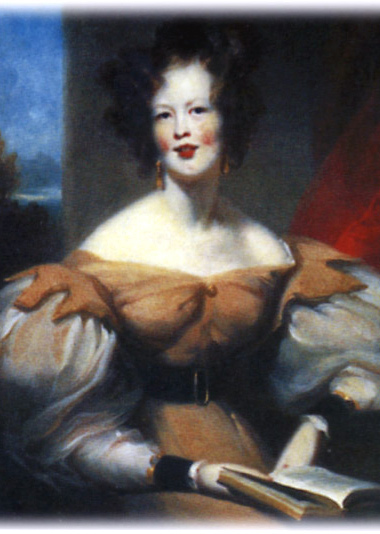 Morrison died in 1834 and was buried in the Protestant cemetery in Macau. 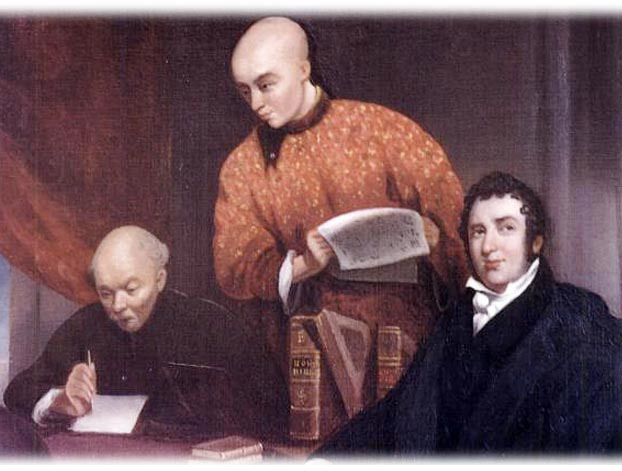 Defying Chinese government prohibitions, Robert Morrison, the first Protestant missionary in China, learned Chinese and hired assistants to help translate the Bible into Chinese and produce the first Chinese-English dictionary. In Macau, Harriet Low became a good friend of Dr. Thomas Colledge, one of the first Western medical men to practice on Chinese patients. While an employee of the British East India Company, he set up an ophthalmology clinic in 1827 in Macau, specializing in the removal of cataracts, and treated over 4000 patients during his time there. In his studio, Harriet saw Chinnery’s most famous picture, which portrays Dr. Colledge after he has restored the sight of a nearly blind Chinese woman. Colledge rests his hand on the woman’s forehead, lifting her eyeglasses and asking his servant to interpret for him. The woman’s son, with the long queue, kneeling in front of him, presents a red envelope containing a letter of thanks. In the far left, an old man kneels with his eyes bandaged waiting for treatment. Harriet Low was shocked by the large number of blind beggars she saw on the streets. Seeing a blind man, she “could not help asking myself what feeling or principle he could have within that could induce him to bear such loads of misery.”. 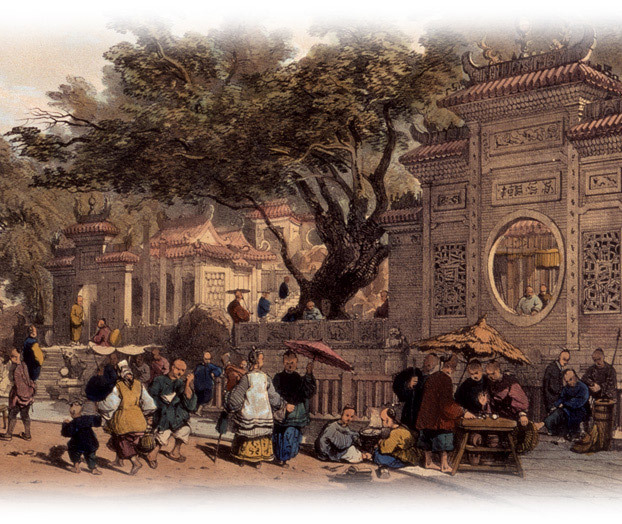 Dr. Colledge’s eye clinic in Macau was the first medical service run by a Western doctor for Chinese patients. 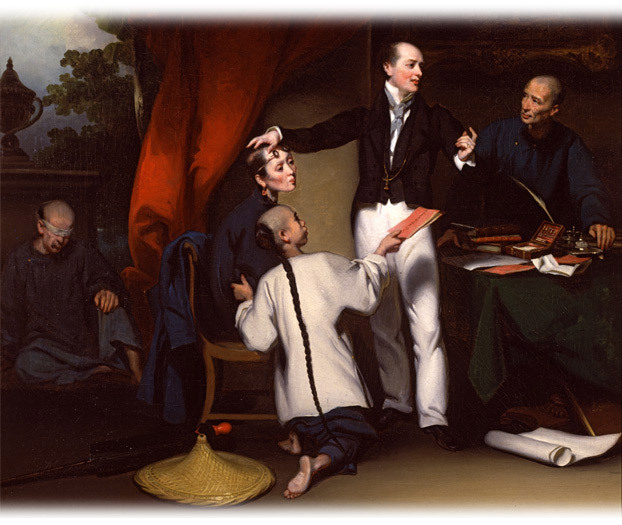 This famous portrait by Chinnery shows the doctor after he has completed an operation on a Chinese woman, explaining the outcome to his servant, who acts as an interpreter. The woman’s son kneels in front, presenting a letter of thanks. Chinese officials opposed the influence of foreign missionaries who had only religion to offer, but they encouraged those who brought knowledge of useful arts such as medicine or weaponry. After Colledge, the Yale graduate Peter Parker continued his medical and missionary work in Canton. 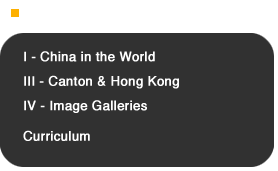 Although Macau never attained the commercial importance of Canton and, later, Hong Kong and Singapore, artists like Chinnery and his compatriots, disciples, and successors succeeded in conveying a sense of human vitality often lacking in depictions of the more thriving treaty ports. Vignettes of the city and surrounding countryside include native people as well as foreigners, and convey at least a general impression of life beyond the foreign community—temples and crowded public places, for example, as well as the back alleys of Macau. Chinnery documented the ordinary life of Macau in paintings and sketches. In this view of the Praya Grande, he places the Chinese boat people in the foreground against the backdrop of the foreign buildings. Many forts topped the mountains around Macau—here, Fort Guia and Monte. Built by the Portuguese for defense against pirates in the sixteenth century, by the 19th century these had become mere backdrops for scenic excursions. The funeral depicted is likely a Chinese ceremony as they preferred to bury their dead on hillsides, where the fengshui, or geomancy, was more favorable. The hand coloring, however, is inaccurate—black and red were not worn in funeral rituals. This Chinese temple was dedicated to Amagao (Mazu in Chinese), the Queen of Heaven and patron goddess of sailors of the south coast, for whom the Portuguese named the city of Macau. Chinese residents are gathered here for family outings, gambling, tea, fortune telling, and worship. 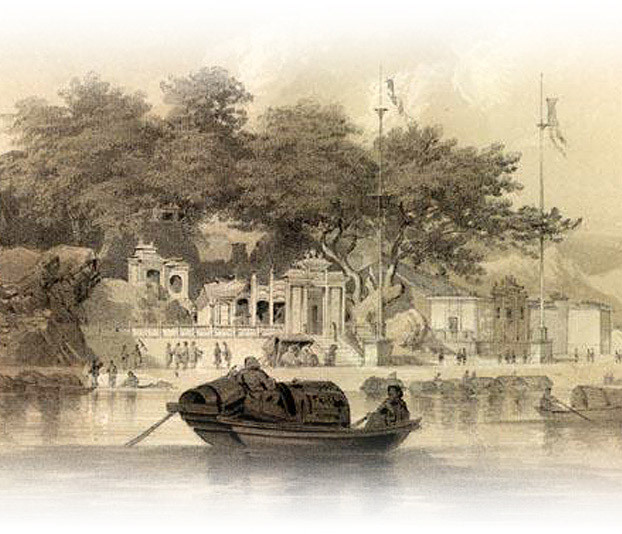 Another view of the Ma Kok temple was made from the riverside by William Heine, who contributed several evocative sketches of Macau when the Perry expedition to Japan made stops in China. Heine drew a romantic view of the Praya Grande crescent illuminated at sunset, with women in white, possibly Western Christians visiting a grave. 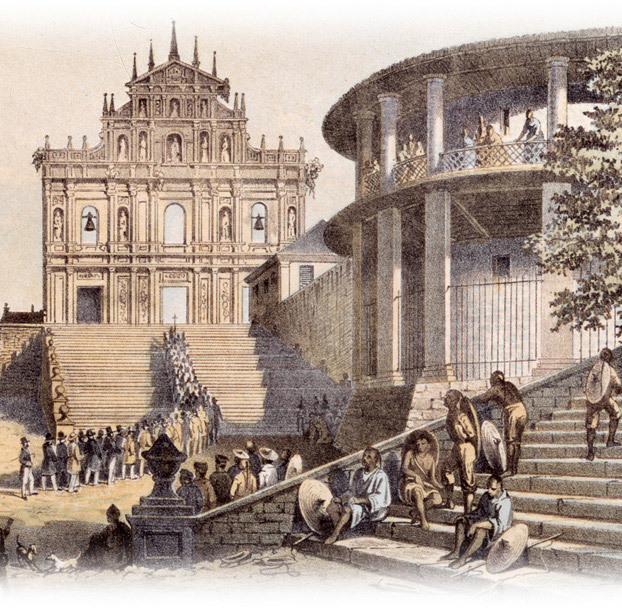 One of the most famous sites in Macau was the subject of another Heine view: St. Paul’s church, built in 1582 for the Jesuits, burned in 1835 and only its facade remains. Japanese Christians expelled from Japan carved its stone facade. 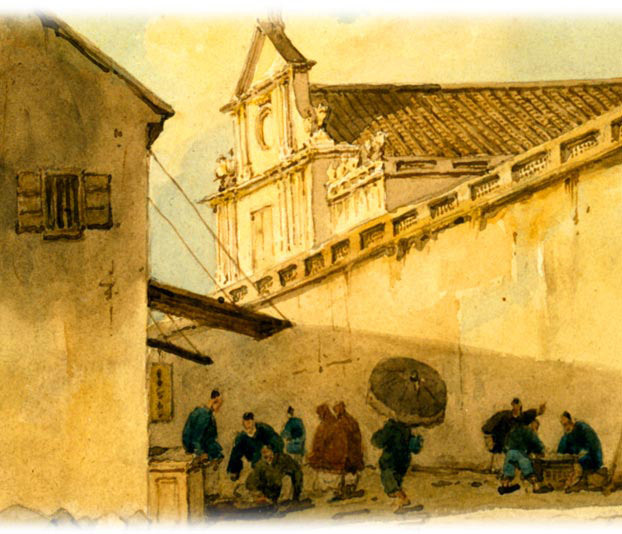 Chinnery also did sketches of the back streets of Macau, which depict the everyday life of the local people. He showed peddlers, porters, food shops, and others resting in the shade behind the St. Dominic’s church. 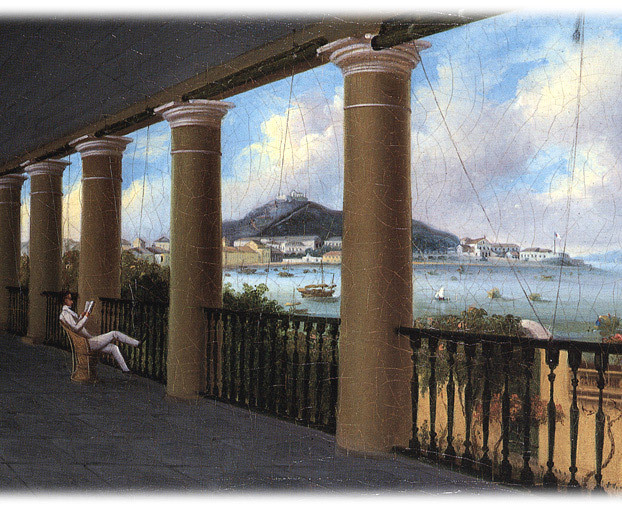 Chinese artists followed the tradition set by Chinnery and Heine, continuing to paint Macau into the 19th century. 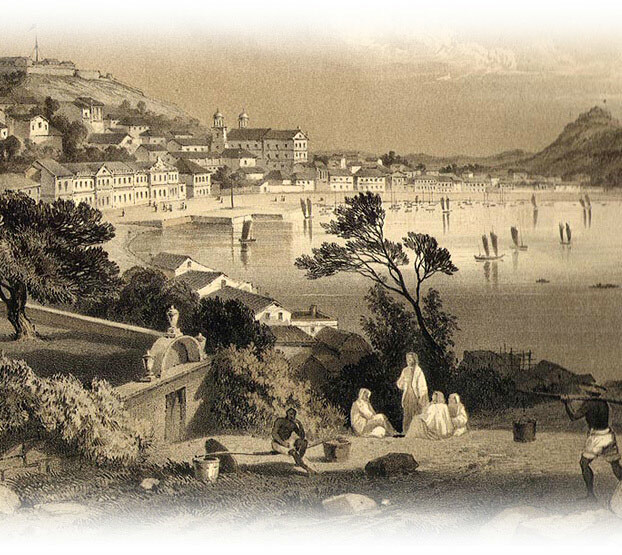 Panoramic views from the hills included all the famous landmarks of the city: the Church of St. Paul’s facade, the Church of St. Lawrence, the Praya Grande lined with shops, and fleets of ships, Western and Chinese in two bays. The town continued to grow in the 19th century, even though the opening of treaty ports in China took away its special character, and the focus of Western traders turned to Canton, Shanghai, and other large cities. 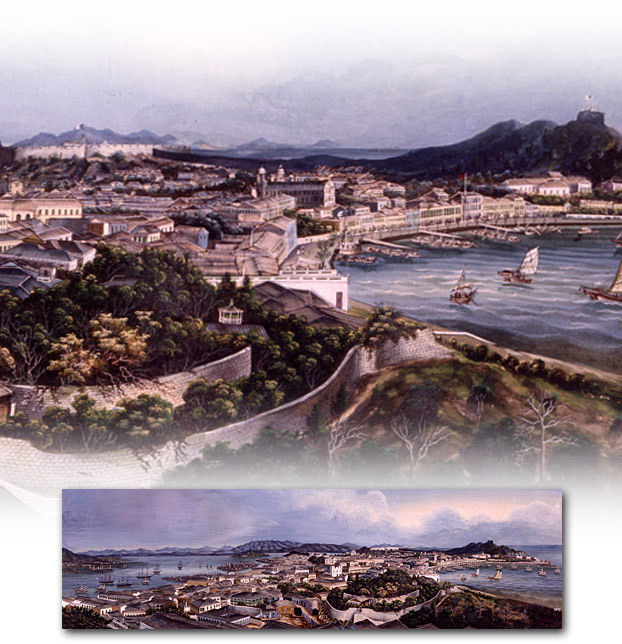 A sweeping overview of Macau shows that the quiet town has grown into a built-up city by 1870.